Slices of Greatness: Pizza in Raleigh, N.C. Started by two Raleigh natives, DeMo&apos;s is steeped in tradition (the dough and sauce are made fresh daily and the cheese is shredded in-house). John Huisman, The Triangle Explorer, recommends going the traditional route with the Godfather, a thin, square-pan pizza with crushed tomatoes and fresh basil. Next on John&apos;s list is another classic Italian spot serving up stone-baked pizzas. You can&apos;t go wrong with the namesake pie, Dante’s Inferno, a blend of mozzarella and Parmesan cheese topped with grilled rosemary chicken, sauteed fresh tomatoes, roasted garlic, crushed red pepper, fresh basil and hot cherry peppers. Yes, it&apos;s that Jimmy V. With a menu featuring both Italian and American fare, Jimmy V&apos;s has a great selection of wood-fired pizzas. Local favorites include the Twenty-Five, a twist on the barbecue chicken pizza, and Rocco&apos;s Pie, a blend of spicy Italian sausage, pesto, mozzarella, roasted tomatoes and basil gremolata. With 100-percent organic pizza sauce and dough and plenty of vegetarian options, Lilly’s Pizza, located in the historic Five Points neighborhood, has been serving pies since 1993. Chana Lynn of RaleighWhatsUp recommends Dante’s Inferno, a sweet barbecue sauce topped with all-natural barbecue chicken, bacon, organic red onions, roasted red peppers and Parmesan. A popular neighborhood bar also at Five Points, The Point at Glenwood offers an extensive menu including wood-fired specialty pizzas. Jen of Downtown Dame suggests shaking things up and ordering the Point Pizza of the Day or the Ala Vodka, a base of homemade vodka sauce topped with mozzarella, peas, mushrooms and prosciutto. Tessa Nguyen of Triangle Foodies offers up a less traditional favorite in the form of folded pizza, specifically the Carolina Pie. A cheddar barbecue crust is rolled out into a circle and then folded in half before being topped with house-smoked pork barbecue, red onions, slaw and a sprinkle of truffled honey. The final result is a half-moon shaped crisp, thin crust that holds up under the weight of its tasty toppings. The list doesn&apos;t stop there. 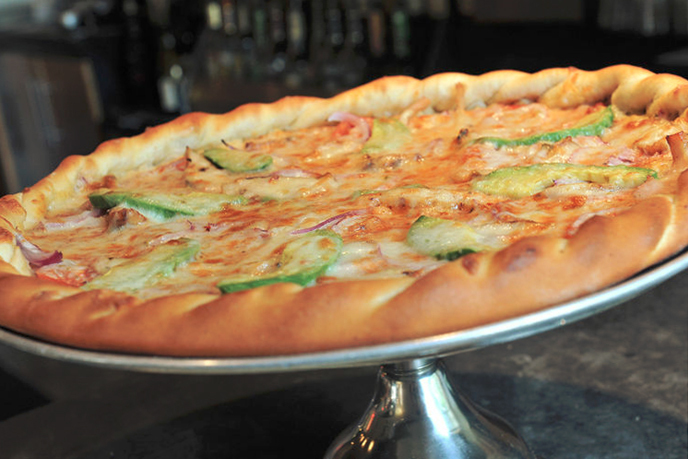 We couldn&apos;t go without mentioning a few other local-favorite pizza spots around town. Moonlight Pizza Company (pizza pictured above) offers up a laid-back patio and great pizza such as its Cow Over the Moon with mozzarella, tomato sauce, meatballs, Italian sausage, pepperoni, Canadian bacon, yellow onions and white cheddar. Pizza lovers rave about Frank&apos;s Pizza & Italian Restaurant, and good reason for that. Said to have the best N.Y.-style pizza in the area by Yelp users, if you want a classic slice, this is the spot for you. Speciality pizzas, such as the Italian Chicken Pizza, are also a must. 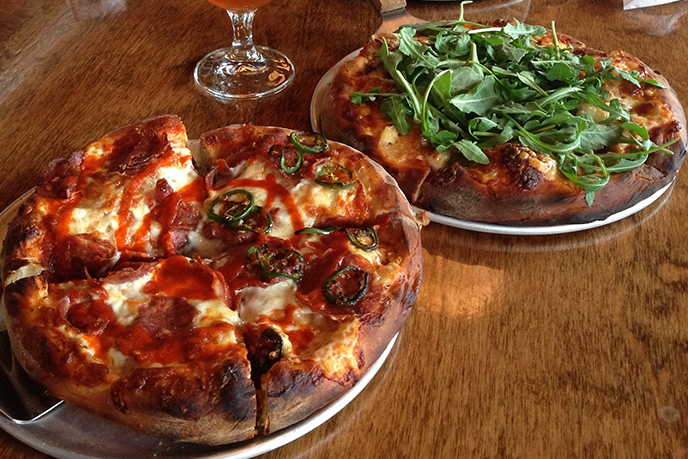 There&apos;s excellent pizza and local craft beer at Lynnwood Grill. Lynnwood Brewing Concern in Raleigh serves up its award-winning beer at the restaurant and nightlife hot spot on Grove Barton Rd., plus cooks up some of the best pizza in the destination. Looking for a great social atmosphere and a place to watch the big game? This is your place. Anna&apos;s Pizzeria (locations in both downtown Apex and Fuquay-Varina) provides a great family-friendly, small-town pizzeria experience with family recipes that have been passed down for generations. Try their speciality "Famous Pizzas" or go with one of the best pepperoni and cheese slices around. Big in both size and flavor, the large slices and pizzas ranging from 14 to 30 inches are a hit at Randy&apos;s Pizza. Pizzas are made in stone/brick ovens and the dough is prepped daily at their three Raleigh area locations in Morrisville, West Raleigh and Cary. 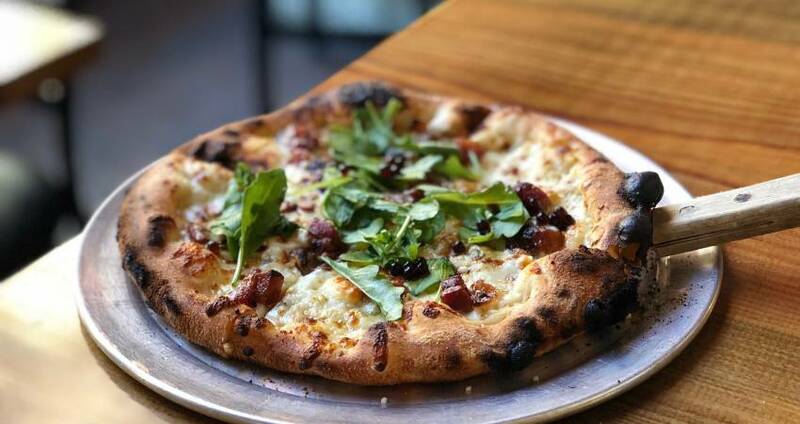 For more ideas, check out all the places to get pizza in Raleigh here. Have a favorite Raleigh pizza that&apos;s not listed? Recommend your favorites in the comments below!